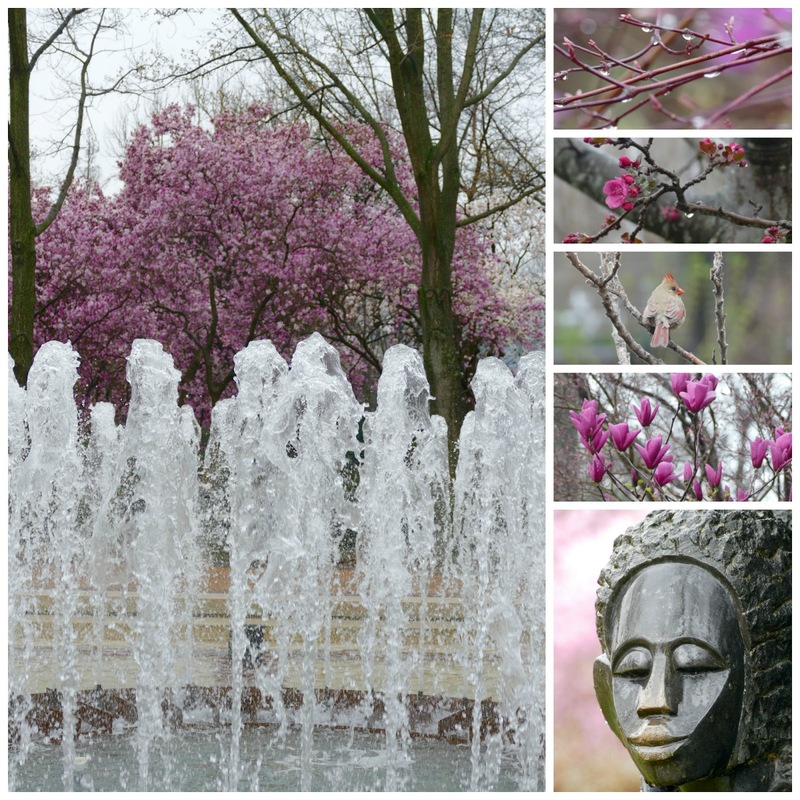 With the return of warmer temperatures, I have been able to get out and shoot some photographs. My forehead finally healed enough to let my bangs hang down and cover up my icky looking surgical sites. 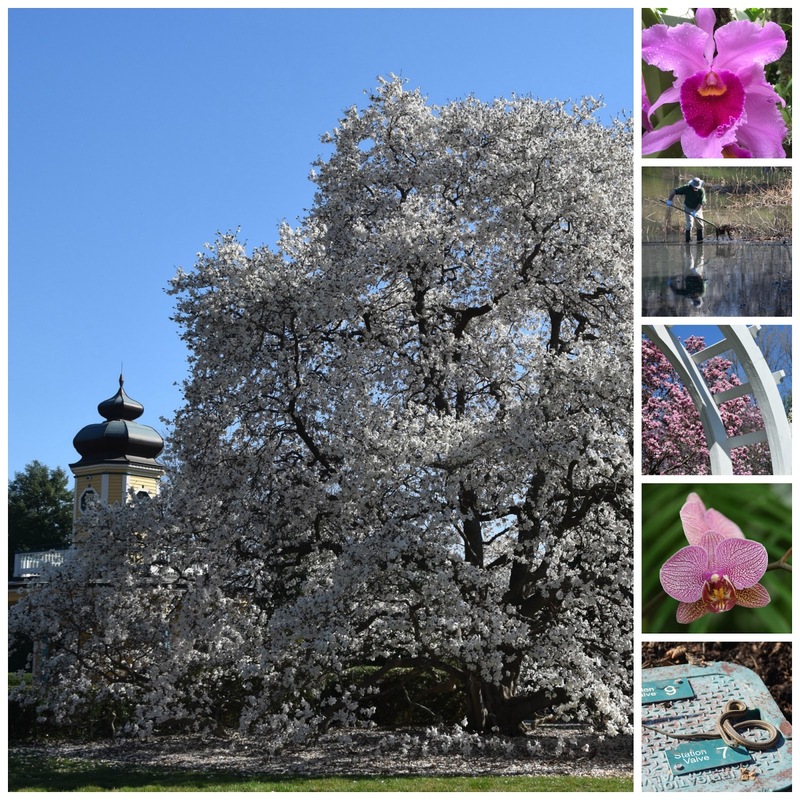 My first couple of trips were to the Missouri Botanical Garden, which is my all-time favorite place in St. Louis. This time of year things change so rapidly that I try to get there once a week. On my first trip I went by myself as it was during the week. When I am out photographing, I really don't mind being by myself. It is nice to be able to take my time and not worry that I am holding someone else up. My second trip was with Jim, as we hurried to the garden to try to capture the snow that fell on a recent Sunday. Unfortunately the garden barely got any snow, so we mostly ended up with raindrop shots. Those can be pretty, too. 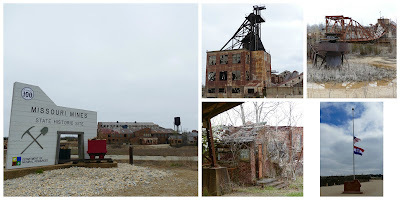 Last Friday my photographer friend Caren Libby invited me to go to the Missouri Mines State Historic Site in Park Hills, Missouri. A photography meet-up group had scheduled a visit there, and she took me as her guest. I had no idea that this place existed. The Missouri Mines State Historic Site was until 1972 an active lead mine. Missouri's lead belt once produced 80% of the nation's mined lead. 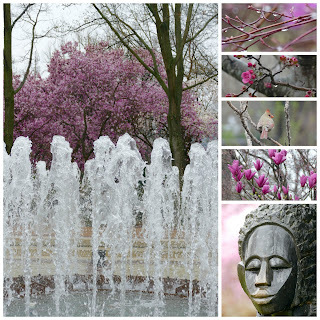 The 8,244-acre tract of land was donated to the State of Missouri in 1975. The mine's former powerhouse has been turned into a museum that interprets the area's lead mining history. The decaying buildings are fascinating to photograph. I just wish the day had not been so gray as I think the photos would have been better with a more interesting sky. By the time we reached Kimmswick for a late lunch at the Blue Owl Restaurant, it was 10 degrees warmer with bright blue skies. 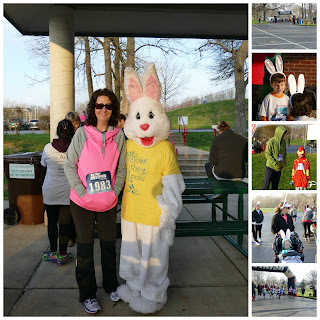 On Saturday I was the volunteer photographer for Bunnies on the Loose, a 5K race put on by the Webster Groves/Shrewsbury/Rock Hill Chamber of Commerce. This was my first time at this event, and I had a blast. My niece was one of the runners, so I got to spend some time with her as well. Soon after I got home from the run Jim and I hopped in the car to make our way to Kampsville, IL, final resting place of the once-grand Goldenrod Showboat. We stopped for lunch in Grafton, which was a good thing as Kampsville is north of Hardin, IL. And in fact the boat is a few miles north of Kampsville. It was quite a trek! 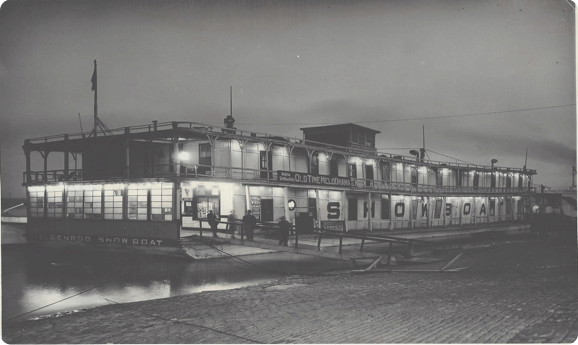 Built in 1909 for $75,000, the Goldenrod was moved to the St. Louis riverfront in 1937. 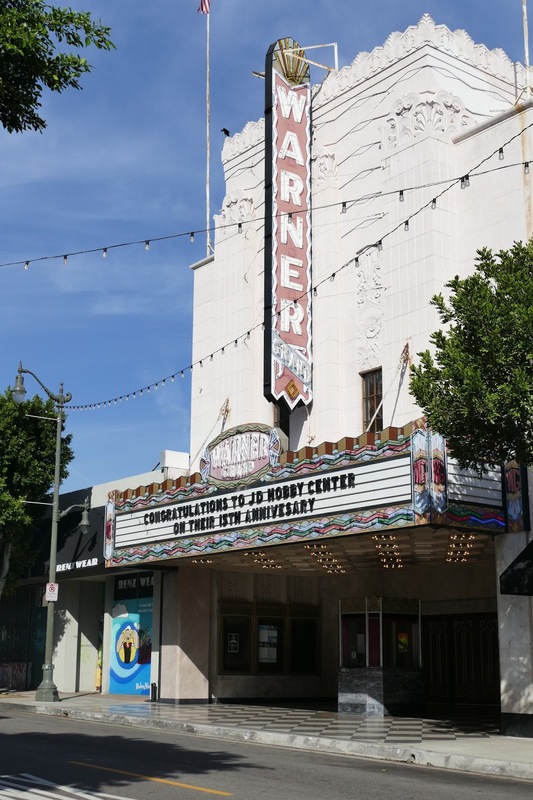 It was declared a National Historic Landmark in 1967, and became a dinner theater in 1975. The City of St. Charles purchased the boat in 1989, and in 1991 it was moved to the St. Charles riverfront. Ten years later the city decided to sell the boat, and found no takers so the Goldenrod was moved to Kampsville. It has been deteriorating ever since. A non-profit group was formed to try to raise money for restoration, but they are finally throwing in the towel. 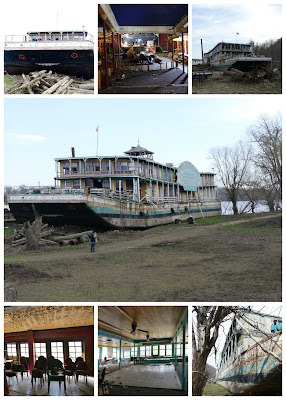 On April 1, the boat will be sold for scrap. The main reason I was interested in seeing the Goldenrod one last time is because back in 1979 or 1980 my family went to the dinner theater. We had purchased tickets for my mom and dad as a Christmas present, and since their anniversary was in January it seemed like a good way to celebrate. My brother Joe was in town for the holiday in addition to my folks, and my sister and brother-in-law had moved to St. Louis by this time. So the seven of us piled into my dad's Cadillac and drove downtown. The Goldenrod was moored on the St. Louis levy at that time, and it was icy and freezing cold that night. The boiler had gone out in the boat, so it wasn't much warmer inside. The area on the second floor where we ate wasn't too bad, but in the theater it was cold! We sat near the front in seats on the main floor, and you could feel the cold through your shoes. My sister remembers soaking her feet in a tub of warm water when she got home. We all kept our coats on during the performance. Before the show began, there was music and the band director joked around with the audience. We had told them it was mom and dad's anniversary, so they put the spotlight on my mom and started singing, "The old gray mare, she ain't what she used to be..." My mom had a wonderful sense of humor (fortunately), and she got the biggest kick out of that. I don't recall the name of the play, but it was one of the old melodramas where the audience was encouraged to boo and hiss at the villain and cheer on the hero and heroine. At one point in the performance one of the cute actresses came down the steps from the stage and got my brother to take him backstage. Now, you would have to know my brother, but he was extremely shy back then. We were all so shocked when he actually went with her and had a small part in the play! After the show we slip-slided our way back to the car, which was parked on the levy. After we all got in the car, the windows immediately fogged up, aggravating my dad who shouted at all of us to, "Stop breathing!" We knew better than to laugh, but really??? At any rate, seeing the Goldenrod took me back to a time when my family was able to get together and share some laughter. Now, like my parents, the Goldenrod will be put to rest and remain just a memory in the minds of those who loved it. On March 7th, following two weeks of celebrating Jim's big milestone with a cruise and company, I went under the knife to remove the two skin cancers on my head. The plastic surgeon began with the one on my temple as he deemed it the "simpler" of the two. For whatever reason, it takes a lot of local anesthesia to numb anything on me. The shots to deaden the area are no fun, but they beat the alternative. Except that I felt him cutting the first spot. Yelping in pain, he quickly gave me another shot. Yay. The removal went quickly, but the stitching seemed to take forever. Why does it feel as though your skin is being pulled 10 inches away from your face? It doesn't hurt, exactly, but it kind of makes me sick to my stomach. Moving on to the second one, which was centered on my upper forehead but extending into the hairline, he commented on the amount of nerve endings in that part of your head. "This will be painful," he predicted. I could tell the second cut was larger than the first by the amount of stitches he put in. How does that old song go? "The first cut is the deepest?" Not so, mister songwriter. Things didn't look or feel too bad when I first got home from the doctor's office. But then the anesthesia began to wear off, and boy howdy! I was allowed to take Extra Strength Tylenol, but not aspirin. And then the cuts began to bleed some. Because they hurt so much, I did not touch them. The post-op instructions say to wash the wounds with soap and water several times a day. No way was I touching them. Needless to say, I did not get too much sleep that night. The next day I attempted to wash the wounds despite the pain, and honestly I thought I was going to pass out. I had to lie down between each one. As I mentioned these are my 9th and 10th skin cancers, but I have never had any that hurt me this badly. It may have been a mistake to have both done at the same time as they were competing for the same skin on my forehead, which was stretched super-tight. I think that combined with the swelling added to the discomfort. There was little sleep on night two either. It took several days before I was no longer taking Tylenol every four hours. The surgeon actually called me on Thursday the 10th to let me know that he had the pathology report. Both of the lesions were basal cell carcinoma, and he had gotten clean margins on them. I was so concerned that he would have to go back in, but this was overall really good news. If you have to get skin cancer, at least basal cell is the least invasive. He asked about the pain level, and I told him it was still pretty bad. He said he wasn't a bit surprised because of all the nerve endings he disturbed. I did not even leave the house except for small walks with the dog until Friday, and then only because I needed food. Jim's aunt had died earlier in the week, so he drove up to Iowa to get his dad and sister to take them to the funeral in South Dakota. He wasn't home to help me out, so if I wanted to eat, I had to go to the store. I slapped a bandage over the most offensive looking wound so I wouldn't scare small children, and headed to the grocery store. It was so sweet because the bagger was all concerned about what had happened to me. I suppose I looked like I had been in a car accident or something. By the end of the weekend I was able to take long walks with the dog again as my face didn't get jarred with every step I took. But it took until the next Saturday before the rest of the dried blood came off and I could use my bangs to cover up the surgical sites. At the end of the day, I am grateful that this is only basal cell carcinoma and that I have health insurance and the means to be able to get rid of the cancer. But like Cher says, "If I could turn back time...", I'd erase the time I spent playing outside in the sun as a kid. All these cancer surgeries are a tough way to get a facelift! Since January I had been keeping a secret from my husband. That was extremely difficult for me. I didn't tell anyone else about it because we have had family surprises ruined in the past by loose lips. 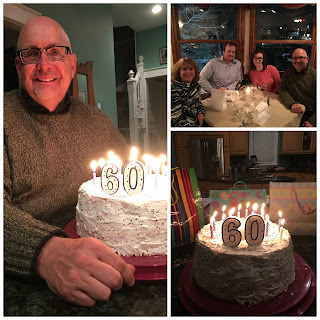 Our son and daughter-in-law had booked tickets to St. Louis to surprise Jim for his 60th birthday, much like they had surprised me in New York when we were there celebrating my launch into a new decade. Jim's birthday is March 2nd, and the kids were not flying in until close to midnight that night. I had earlier suggested to Jim that we celebrate his birthday over the weekend since we had just gotten back from our cruise and visiting Katie in LA. He was totally fine with that idea. SWT Design took him out to lunch on the 2nd, and invited me to come along. They also had a pretty awesome cookie cake made for him, so I didn't feel too bad about not having cake on his actual birthday. The next morning I picked up Andy and Megan at the hotel where they had spent the night since they were flying in so late. I couldn't figure out how I was going to sneak out of the house at 11:30 at night to get them without arising his suspicion, so they decided to go the hotel route. We drove directly to his office and surprised him there. And was he ever shocked! He had no idea the planning that went on behind his back. Tee, hee! We took him to a new restaurant, The Slider House in Rock Hill, for lunch and then dropped him back off at the office. He was able to take a few hours off over the next couple of days, and we had a really nice visit with the kids. Friday night we took him to Citizen Kane's for the real celebration, and then had cake and ice cream back at the house where he could finally open his gifts. On Saturday, Megan's mom and dad drove over from Indiana. We always have such a good time with them! We are so blessed to not only have a daughter-in-law whom we love, but one who comes from such a fabulous family as well. We chatted and ate pizza, and then brought out the card games. We broke long enough to enjoy the meal Jim and I prepared, and then jumped right back into a hot game of Sequence. One game led to another, and we finally called it quits at 1:00 in the morning. As the kids had an early flight the next morning, we thought it prudent to head off to bed at that point. Six o'clock a.m. came way too early Sunday, and before we knew it everyone was taking off for home. 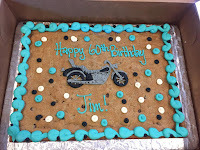 I think I am safe in saying that we made turning 60 pretty memorable for Jim! The benefit of taking a cruise out of Los Angeles was that we were able to tie in a visit with our daughter. It is hard to believe that she has lived there four years already. While Jim had seen the apartment that she now lives in, I had not as she had moved since the last time I was in LA. Her unit is three stories and has an unusual floor plan. But it works well for her. As a mom, I appreciate the fact that the underground parking is gated, and even then you need a key to access the staircase to the apartments. I like knowing that she is safe. The real beauty of the apartment, though, is that she can walk to work. That is almost unheard of in Los Angeles. It certainly saves on insurance as well as gas and wear and tear on her car. After we arrived at her apartment we visited awhile before going to the Road to Seoul Korean barbecue restaurant for lunch. After all, Jim and I had hardly made a dent in our 10,000 calories per day that we had grown used to on the ship. 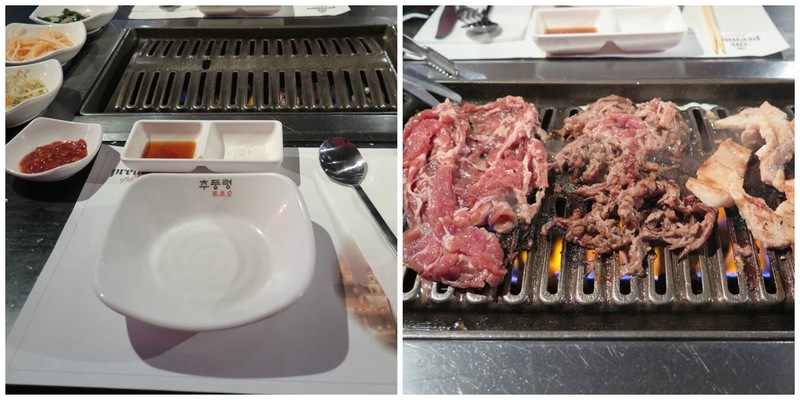 The restaurant brings the food to your table, and you grill it yourself. That really turns your meal into an event. Although the irony of paying so much money for lunch and then having to cook it yourself was not lost on me. After lunch we went to the Petersen Automotive Museum. Jim was interested in the architecture and re-purposing of the building, but we decided to go inside as well. Opened in 1994, the museum is an exploration of the history of the automobile and its impact on American life and culture. From early automobiles to extreme luxury cars to vehicles used in movies and TV shows, this museum has a little bit of everything. We all very much enjoyed it. Just down the street outside the art museum is an exhibit called "Urban Light." 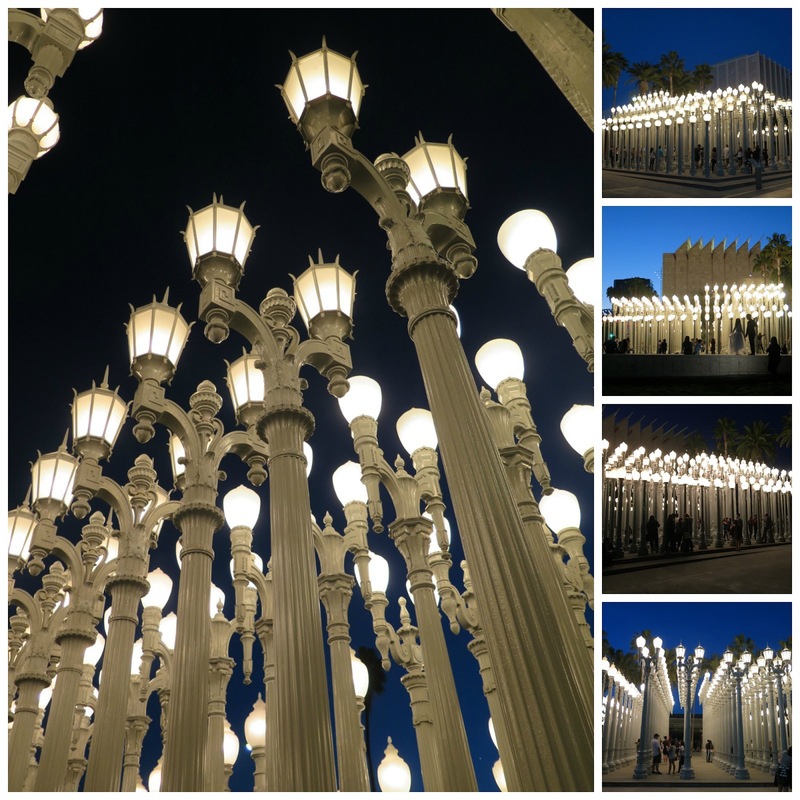 Consisting of 202 antique lamp posts, it makes quite a display. It was fun to see the ways that people were interacting with the lights. 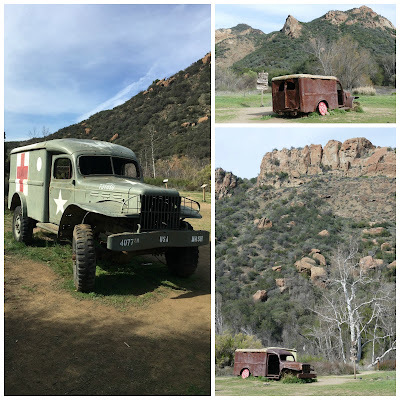 On Sunday after a late breakfast we drove about an hour north and west of Los Angeles to visit Malibu Creek State Park. Consisting of over 8,000 acres, the park opened in 1976 on land that was once owned by 20th Century Fox Studios. 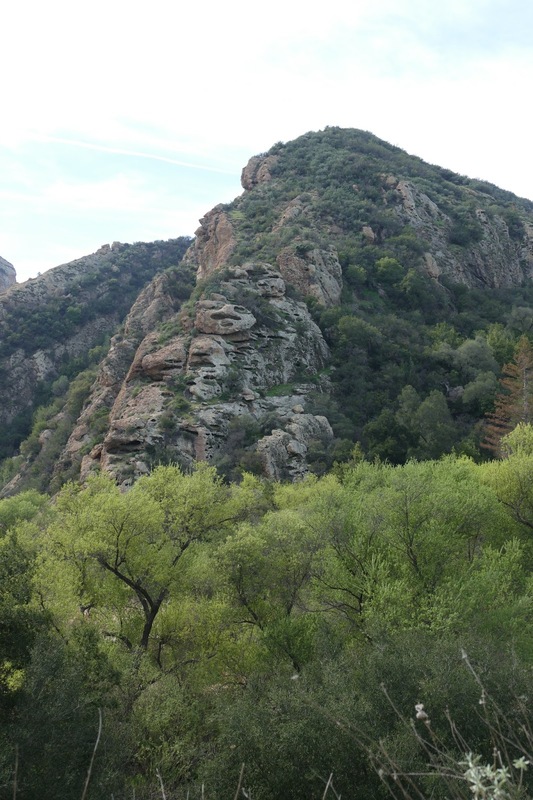 There are 15 miles of hiking trails through prairies, canyons and up steep hills. 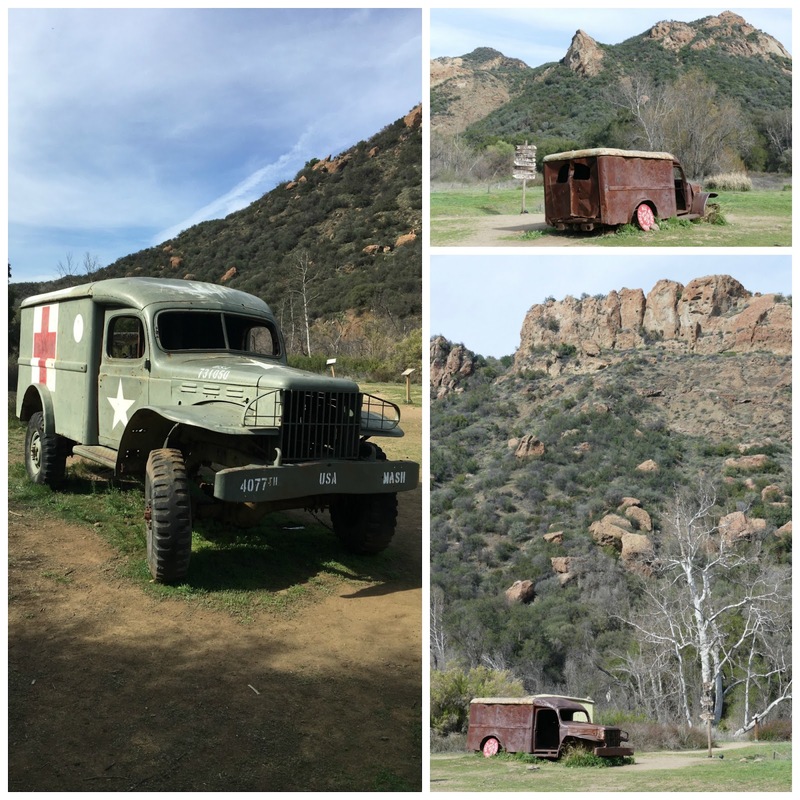 We chose the trail that would take us to the site where some of the television series M*A*S*H had been filmed. While everyone says that this is an easy hike, I noticed that most people coming and going were 20-30 years younger than me. It was two and a half miles to the site, with challenging hills that near the end shrunk to single file, rocky paths. Thankfully we had hats and our water, and managed to get to the show location. And more importantly, back out again to the car. It was a good 5 mile hike round trip, and made me feel better about all I had been eating. On the way back to Katie's apartment we stopped for dinner at a restaurant in Malibu that sits right on the ocean. The service and food were mediocre, but you could not beat the scenery. The next morning we flew home, thus ending our vacation. But not the celebration of Jim's birthday. There was more to come! 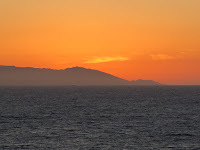 Friday was the last day at sea as we made our way back north to Los Angeles. 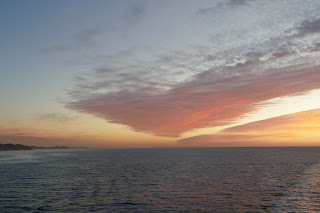 One of the (only) benefits of being a poor, light sleeper is that I got to see some incredible sunrises on this cruise. Above is what I woke up to Friday morning. We had breakfast at the buffet as usual, and then hit the morning trivia game where we came in second yet again. Always a bridesmaid... The trivia games were pretty interesting as they tried to mix things up. For example, in one you had to name not only the One Hit Wonder song that they played but also the artist who sang it. Really? My favorite variation was Majority Rules. Only Jim and I went to that one, so we joined another couple to form our team. After each question was asked you wrote down your answer and ran it to the trivia host, where the answers were quickly tallied. The answer written down by the most teams was the winning answer, whether right or wrong. "Name one thing that people do in an elevator that is annoying?" My first thought was "fart", but then I come from the Kubler family. Our team wrote down "talk on the phone." Winning answer? Fart. Go with your gut, people. Har, har. Needless to say, the answers were very entertaining, and it was undoubtedly the most fun I have ever had playing trivia. After trivia we walked around the ship a bit, and before long it was time to eat. For the first time we decided to try one of the main restaurants for lunch. Normally we just ate at the buffet because it was fast and easy. We joined a table of four other women, three of whom were from California. The fourth was from Austin. The meal was very good, and it was fun to change up the conversation a bit. We packed a bit in the afternoon as the large suitcases had to be placed outside our cabin door by midnight. By then it was time for more trivia, and lo and behold we came in first! And I have the Princess chip clip to prove it. No champagne for trivia on the last day - boo. As we had reservations at the Crown Grill that night, we headed back to the room to shower and change. There were three restaurants on board that you had to pay extra for, and this was one of them. We were celebrating Jim's birthday that night, so we wanted to do something special. The service was exceptional and we all enjoyed our meals. The only thing that was off-putting came at the end. 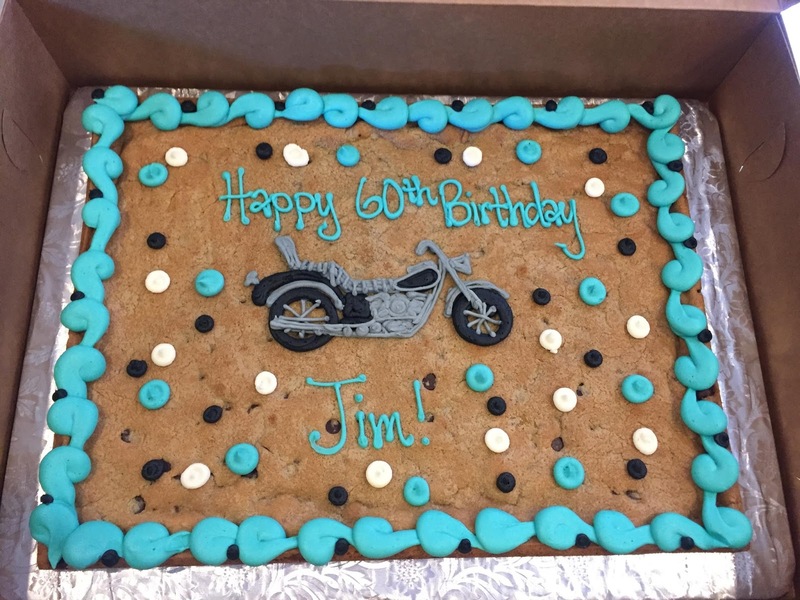 They knew it was Jim's birthday, so they brought a cute little special cake for him. And then several staff members came over to sing happy birthday. Badly. Very badly, and apparently on purpose as we heard them sing at another table later. I guess they think it is funny, and it might have been if done in one of the casual restaurants. But I did not think it was appropriate in the elegant setting. Jim and Paul hit one last trivia game after dinner, but I went back to the cabin to finish packing. We had our bags out before the designated time, and spent another restless night at sea as the water was again pretty choppy. 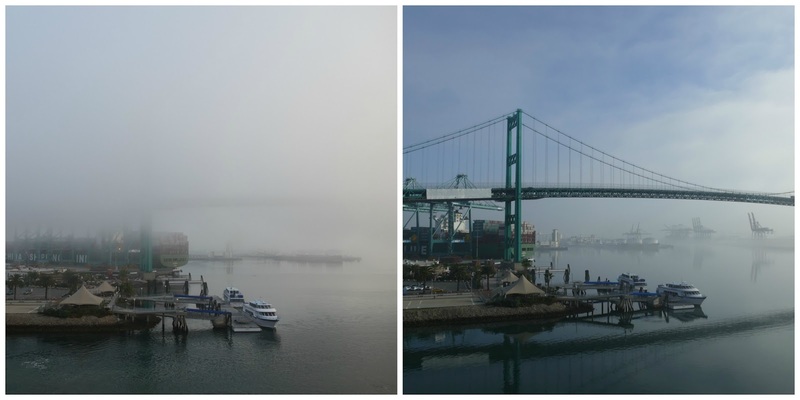 Saturday morning was so foggy in Los Angeles. I had no idea the city got that kind of weather. I always think of San Fransisco being shrouded, but not LA. I have to admit, it made for some fun and interesting photos though. We met the Corbins early for breakfast as they had a disembarkation time of 8:00. It was great to have one last meal with them before saying good-bye. We did not have to leave the ship until 10:30, though everyone had to be out of their rooms by 8:00. We were going to Katie's from the port and she had to work that morning, so we were in no rush to get off the boat. We spent time lounging outside and catching up on emails and other messages as we finally had Internet service for the first time in seven days. Disembarkation went smoothly and quickly, and we were soon waiting for our Lyft ride outside the terminal with our luggage. We hit our first big snag of the trip when the driver could not locate us. I had indicated to him that we had just gotten off a cruise and were at Berth 93. I don't know where in the world he was, but after 20 minutes he gave up on us. When I contacted Lyft the second time, I actually called and spoke to the driver. I asked him if he had ever picked anyone up at the port before, and he said that he had. I told him that we just got off the Princess ship and we were at Berth 93. No problem, he says. Well, he did have a problem - the same one as the previous driver. A Princess employee told me that Lyft and Uber drivers were actually not supposed to pick up in our area (though I saw a couple of Uber pickups going on), due to the taxi contract. He said we needed to walk out of the port and get picked up there. So we schlepped all our bags a few blocks outside the port, and arranged for pickup there. It turns out that there are two Perth 93s in the area. Why? Why would they do that? Thus the confusion. At any rate, we were in a car and on our way to Katie's and ready to spend a couple of nice days with our girl. My final thoughts on this cruise. 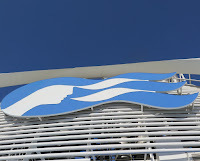 This was our fourth cruise and the second time we have used Princess cruise line. This ship is smaller than many others as it was built in 2006. That has its own pluses and minuses. I like having fewer people on board, but that also means less amenities than the larger ships. 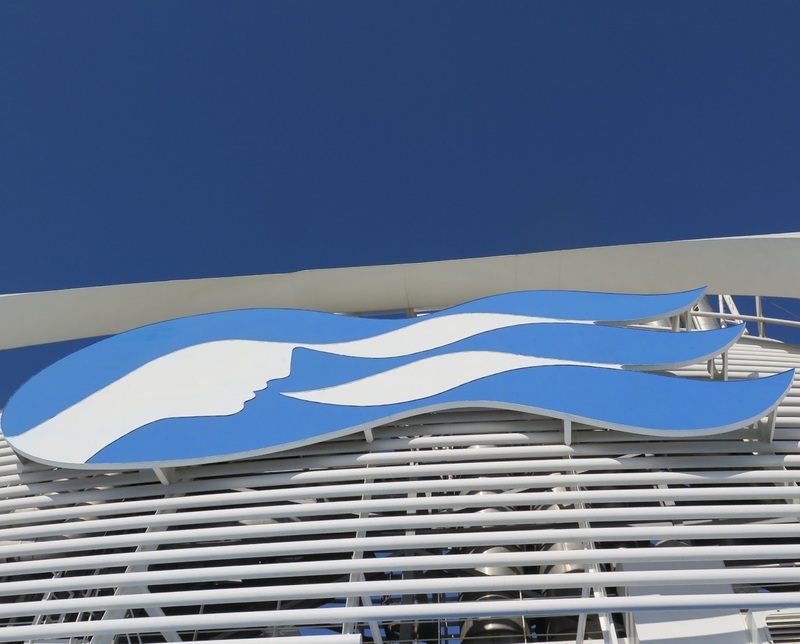 The Crown Princess is due to be refurbished in 2016, and it will be interesting to see what they can do as they can't change the footprint of the boat. 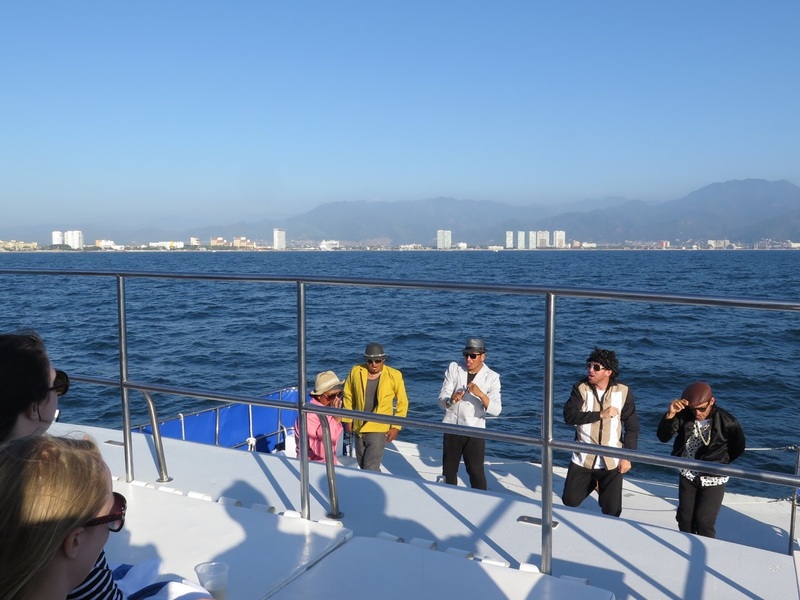 This was our first cruise on the Mexican Riviera, and I would not do that route again. Having only three stops in seven days equals too much time on the ship for my liking. Every other cruise has had four or five stops. I also do not think the ports of call are all that interesting. There were over 200 kids on our ship! I have never been on board with that many children, and it was not an enjoyable experience. You could never get close to a hot tub as they were all packed with kids, they were running around wild, and the crying in the nice restaurants was just uncalled for, in my opinion. The folks in the stateroom above us had a toddler, and all that child did was whine. We could not sit on our balcony if they were out due to the whining. It certainly wasn't peaceful and restful out there. 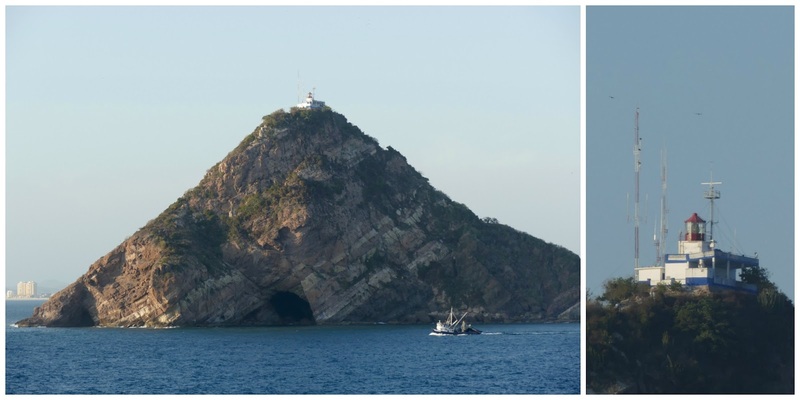 A woman who had done this exact same cruise back to back - again, why? - told us that the previous week there were 500 kids on board. Why these children, predominantly Americans, were not in school is beyond me. We planned the timing to avoid spring breaks. I sound like I don't like kids, and that is not the case. It is just when I am not traveling with children I don't want my vacation to be marred by other people's kids being obnoxious. 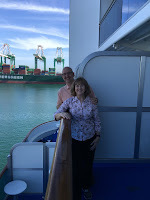 All that being said, it was wonderful to get away, especially with such great friends, and to cruise the Pacific Ocean, which we hadn't done before. Princess knows how to do things right, and the excursions were great fun. It definitely will not be our last cruise. On Thursday we entered the port of Cabo San Lucas around 6:30 in the morning, greeted by another beautiful sunrise. It was interesting to see a U.S. naval ship in the harbor. That would be a nice assignment. Inexplicably, we had the shortest amount of time in this port, which has no actual dock for large cruise ships. All passengers going ashore have to be tendered into port, so you have to build in extra time for that. 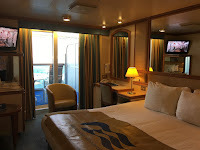 Due to time constrictions, we booked our excursion through the cruise line. We met for breakfast at 7:15, and then hurried to the meeting place we were assigned to catch our tender into Cabo. 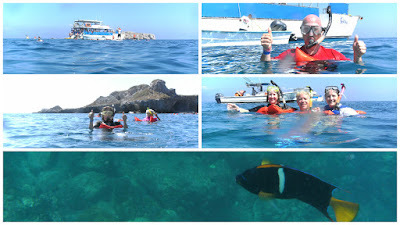 We had decided to take a Zodiac tour and snorkel trip. A Zodiac is an inflatable boat that can reach high speeds and thus is desirable to the military - think Special Forces here. None of us had been on one, and of course the guys were all excited about the ride. I wasn't thrilled about being bounced around, but on the plus side the boat doesn't hold too any people so the excursion was small. 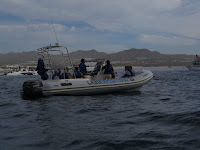 We had eight in our Zodiac, plus the driver and a guide. 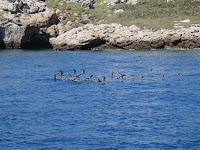 A second Zodiac brought several more people from our ship, though we really didn't see much of them once we took off. Below is the other Zodiac. One of the main attractions in Cabo is El Archo. Literally translated as The Arch, the three stories tall rock formation is also referred to as Land's End because if you followed a line south from here you would not touch land again until you reached the South Pole. 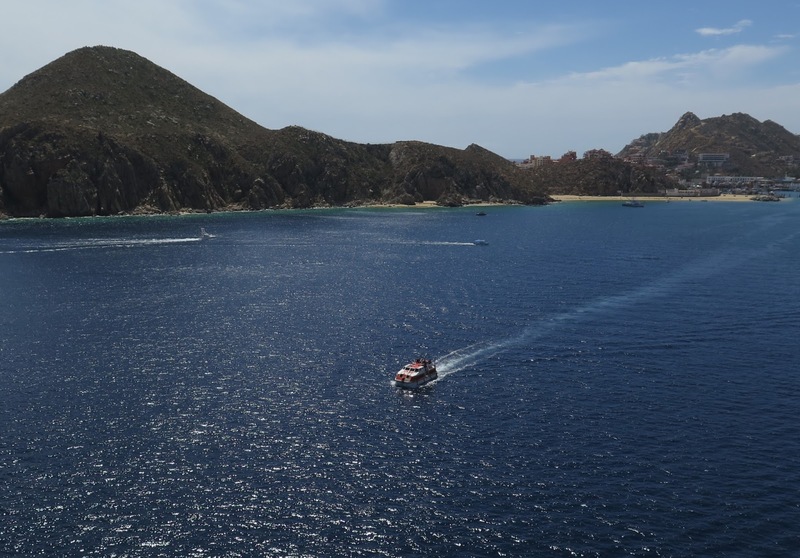 The Pacific Ocean becomes the Gulf of California (also known as the Sea of Cortez) here. 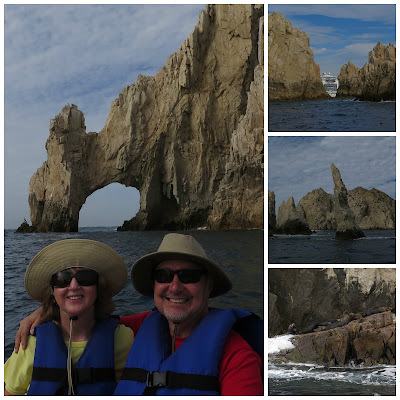 The rock formations are incredible, and the boat was able to take us fairly close to them. There were numerous sea lions hanging out on the rocks. 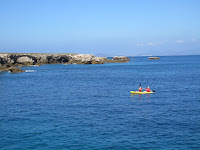 After ample time to study the rocks and take photographs, we headed to our first snorkeling location. The water here was a bit colder than Puerto Vallarta, and I was wishing I had the wet suit provided on the tour there. On the plus side, it did get me swimming faster! All was going well, and we were enjoying the variety of fish in the area when the female guide swam up to Paul, Kathy and me and told us to swim to a new area. "Towards the shore?," Paul asked. She nodded yes and said she would go and tell the others. We took off in the direction she indicated. And that is when I thought I was going to die. The three of us got hit by a humongous wave. I am talking one that expert surfers would have been ecstatic to ride. We barely recover from that, and I turned around and thought, "Holy crap!" Here comes another one, just like the other one. I have never been in that situation before. Do you ride it out? Dive into it? Pray? I saw Paul dive into it, so I followed suit. 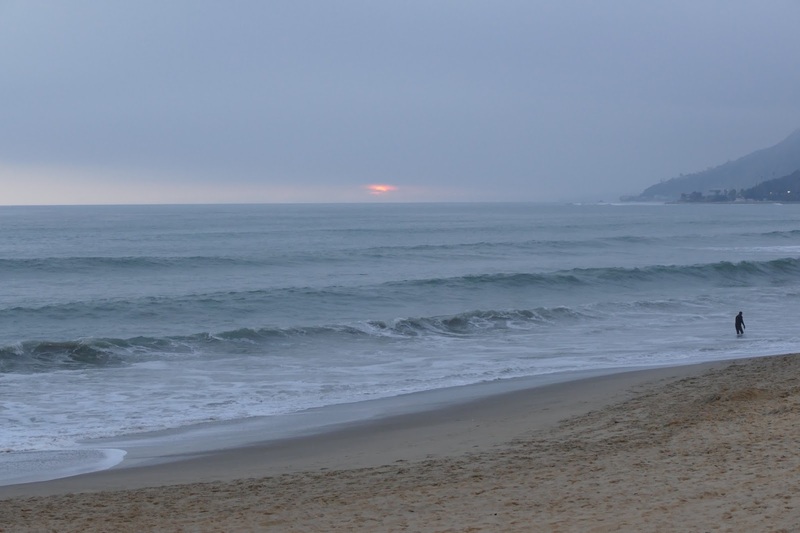 Then a third one came, and I was growing tired from fighting the waves. When I could finally stick my mask back into the water, I about had a heart attack. I was inches above some coral, and I could only image cutting myself on it. I swam as hard as I could to the left, not knowing if it was any better over that direction. Thankfully, there were no more huge waves, and I took some time to just float for a bit and rest. I honestly did not know if I had enough strength and energy left to swim all the way back to the boat. I had been sent pretty far away from it. Eventually I made it back, as did Kathy and Paul. I don't think I have been so scared in my life. And we still had one more snorkeling stop to make. 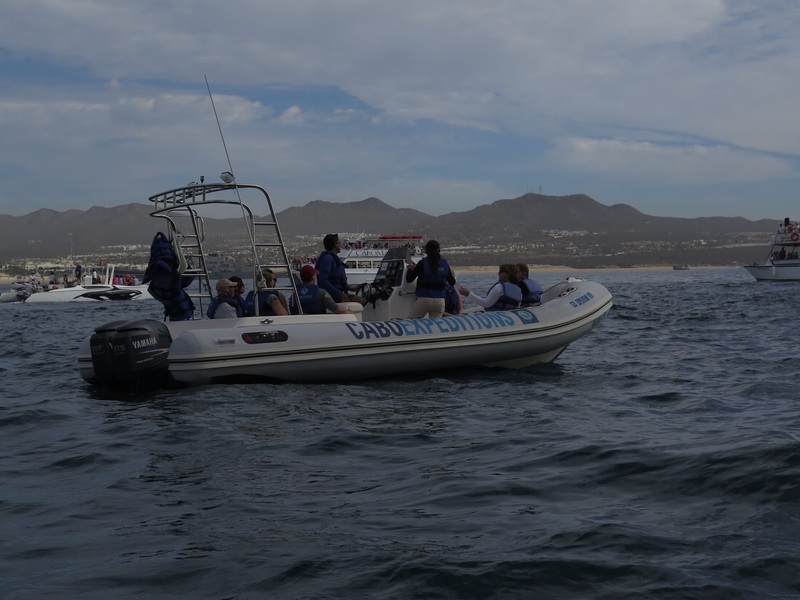 The female guide spoke softly in Spanish to the driver when she got back in the boat. She never said a word to the three of us, but Jim said she seemed pretty shaken up by what had happened. As well she should. I wasn't sure if I was going to even get out of the boat at the next stop, but we ended up in a pretty quiet cove. So I decided to get back in the water, which was thankfully warmer than the last stop. I am so glad I made that decision, because the coral was prettier here, and there were so many fish! It truly seemed like we were swimming in an aquarium. On the way back to Cabo we saw a whale. Although this was the migration season, this is the only one that I saw on the trip. I am not going to lie though. The best thing I saw was the cruise ship. After my ordeal, I was happy to get out of the water. Back on ship we showered, played some trivia and had a low key dinner at the grill so we could eat outside. Besides, it was another formal dinner night, and none of us felt like dressing up. Then we watched the movie, "The Martian" outdoors on the big screen, and followed that by seeing the comedy/music show by Steve Moris, who used to play with the Beach Boys. It was a nice ending to the day. 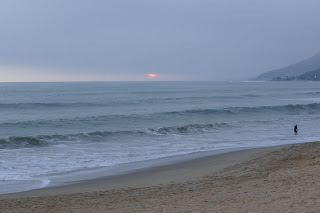 We arrived at Mazatlan at 7:00 a.m. on Wednesday, February 24th. This city was founded in 1531, and has a surprising population of nearly 500,000 people. While it was once a popular tourist destination, in 2011 the cruise lines stopped going to this port due to a huge increase in crime. 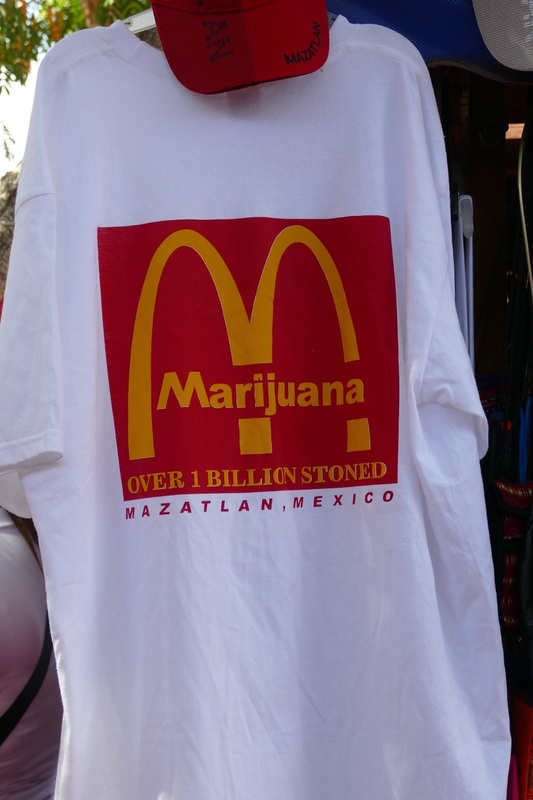 One of Mexico's largest crime organizations is based in the area. It took a couple of years before any ships returned to Mazatlan, and I am not sure that all lines made the decision to add this stop back on their itinerary. After all, the U.S. State Department still has warnings about non-essential travel to this part of Mexico. So perhaps it wasn't smart for us to decide to do our own thing in this town, but none of the planned excursions really interested us. 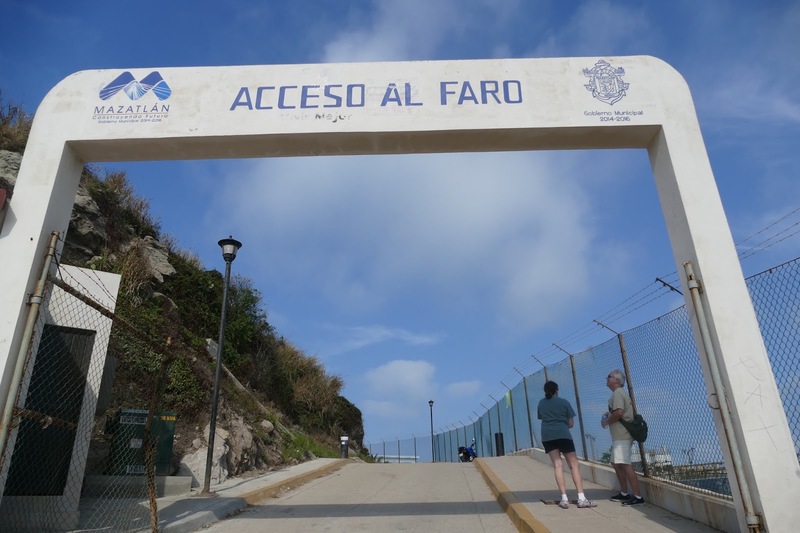 Doing research ahead of time, I had suggested that we take a cab to the area where we could hike up to El Faro Lighthouse. At 523 feet, it is the highest (but not tallest) lighthouse in the Americas and one of the highest operating lighthouses in the world. El Faro cast its first light in 1879. Hiking up to see it takes more than 325 steps and involves more than a 500 foot elevation change, so it is a somewhat demanding adventure. The only paved portion of the trail is shown in the photo on the right. The rest of the path is dirt or stairs. The day was sunny and quite warm, and luckily we came prepared with enough bottles of water. The actual lighthouse itself is not much to look at, though we did climb the spiral staircase inside it to see the light fixture. As promised, though, the views along the trail and at the top made all the exertion well worth it! As suggested on the travel site, TripAdvisor (I don't leave home without consulting this website regarding places to stay, things to do and where to eat, and I don't receive any compensation from them, but am a frequent contributor as I believe in giving as well as receiving), we had arranged for our cab driver to return to pick us up at the entrance two hours from the time he dropped us off. 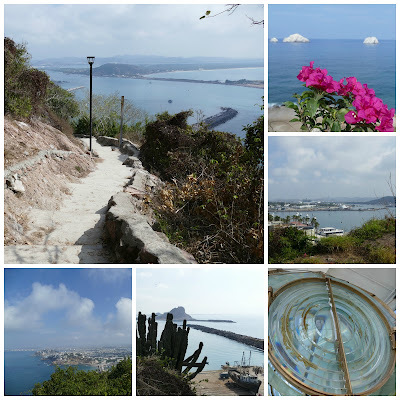 We figured that would give us ample time to walk up, take photos, and walk back down. We actually got to the gate in an hour and forty-five minutes, and sat to wait for the cab. When he hadn't appeared after two hours and fifteen minutes, we took another form of transportation back to the city center. It was a small truck with benches in the bed for passengers. They are innovative in how they move tourists around, that is for sure. 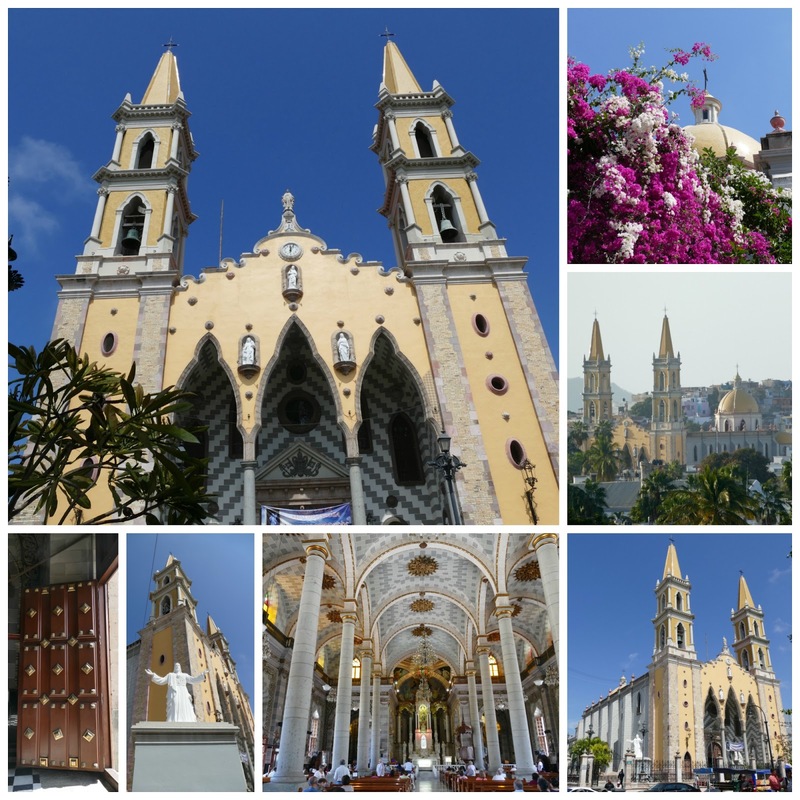 The main attraction in the old town area is the Cathedral of the Immaculate Conception. Construction on the cathedral was completed in 1899 and it became the second Catholic Church in Mazatlan. In 1958 it was named a basilica cathedral. I love visiting old churches, and this one did not disappoint. From the town center we took another cab, this time a golf cart, back to the touristy area by the port where we saw these two items. 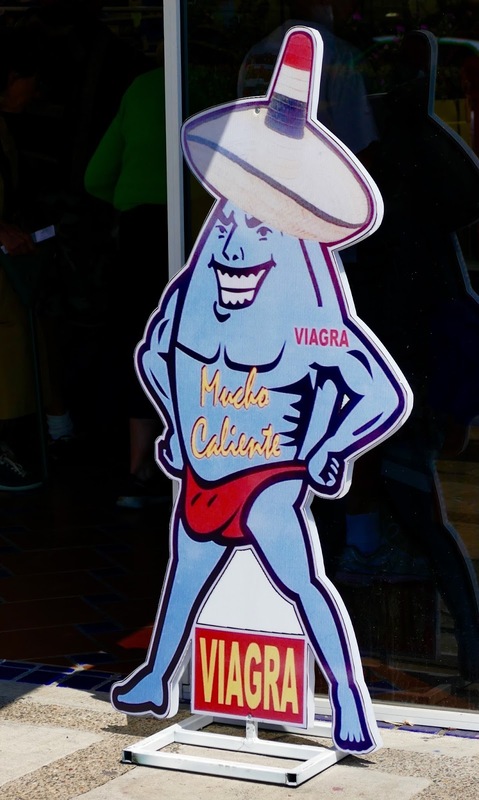 You just have to love a Mexican sense of humor! 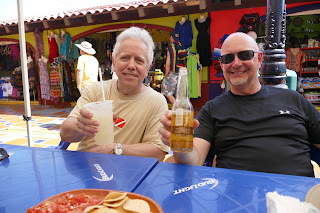 We stopped at a Mexican cantina for chips and salsa along with a beverage before walking back to the ship. We decided it would be wise to eat a late lunch on the ship rather than having a meal in town. 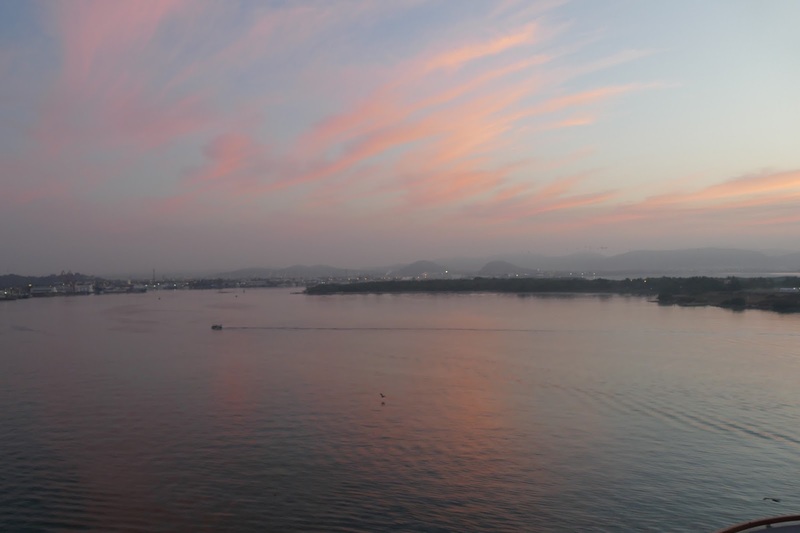 It was fun to see the lighthouse from the ship as we left the port of Mazatlan. We came, we saw, we conquered! 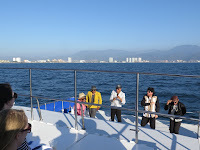 Our first port of call was Puerto Vallarta, Mexico. This was a sleepy little fishing village until John Huston filmed "The Night of the Iguana" there in 1964. The film starred Richard Burton, and his then-lover Liz Taylor flew down to keep an eye on Burton and his co-star, Ava Gardner. The resulting media buzz put the locale on the map as a tourist destination. 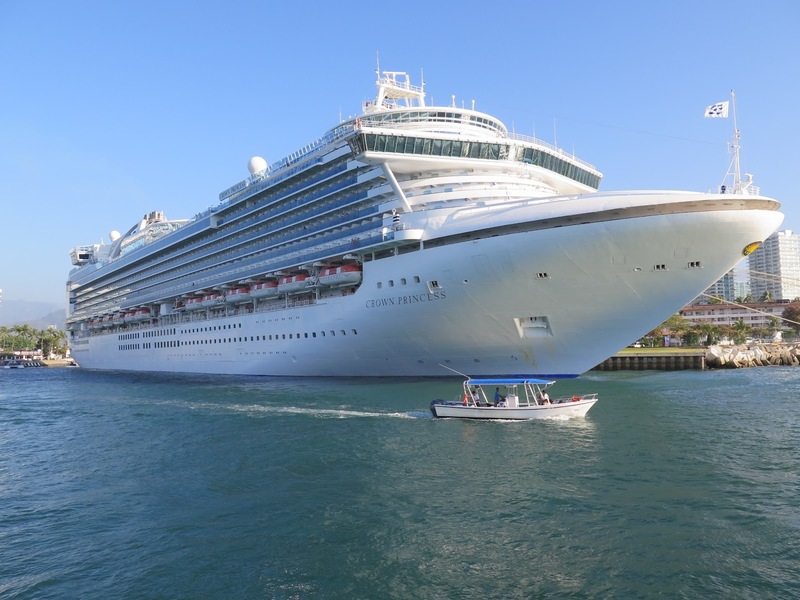 Resorts and cruise lines followed the buzz. 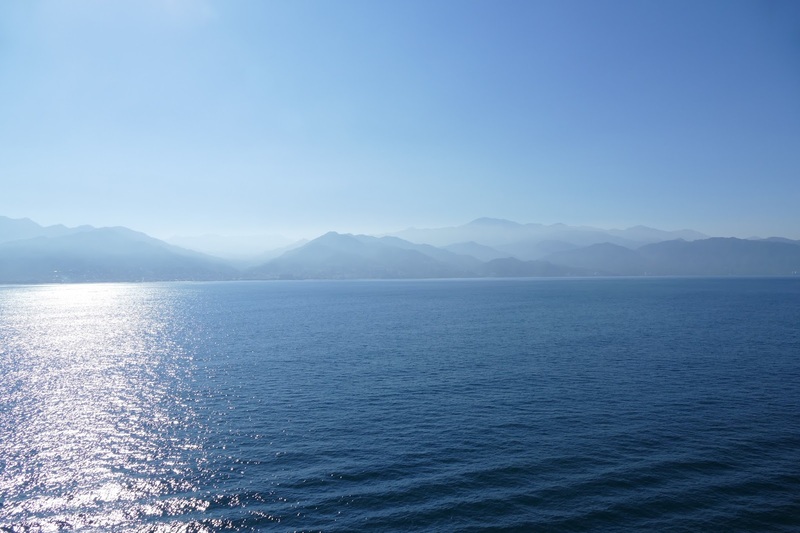 We arrived at 10:00 a.m. on Tuesday the 23rd, and because the port is located north of the city there is not much to see once you are docked. The four of us booked an excursion through Princess for this port of call. 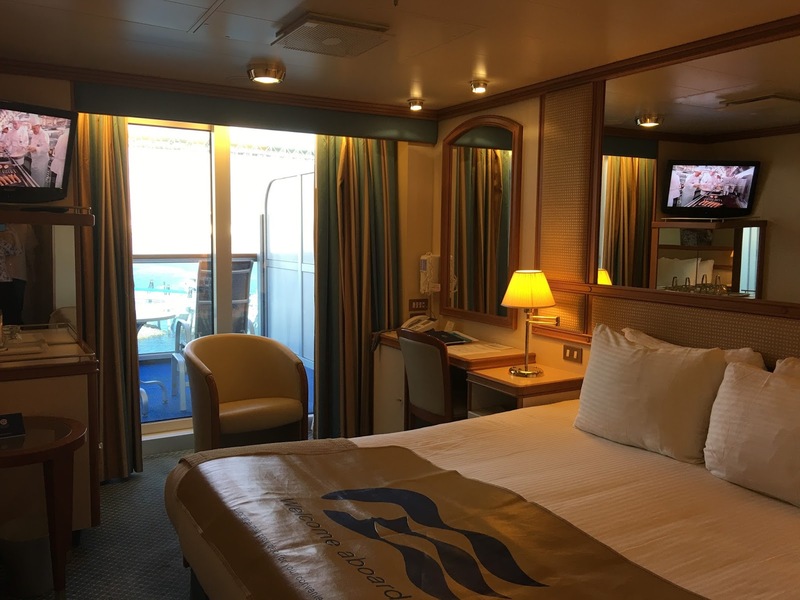 The benefit of using the cruise line is that they make sure you get off the ship in a timely fashion and also, more importantly, back on the ship before it sets sail. If their excursion screws up the timing and you miss the ship, they fly you to the next destination. We grabbed breakfast at the buffet before leaving the ship to meet up with our tour group. We had selected a sailing/snorkeling adventure to Marietta Island, which is a national park and bird sanctuary. 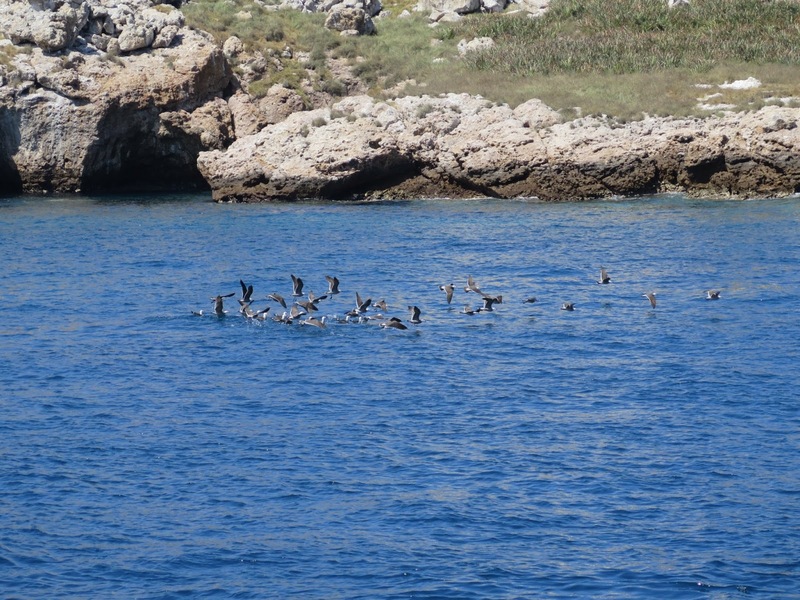 As it was breeding season, we saw many of the 72 varieties of birds who make the island their home. Many on the excursion took the opportunity to swim through a cave to get to a private beach. As they mentioned you needed to be a very strong swimmer due to currents, and that they wouldn't know what the head clearance in the cave was until they got in there, Kathy and I chose not to do that portion. After everyone was back on board, we motored to a new location to go snorkeling. Once we were all back on board, the crew served us some amazing tropical cocktails and a buffet lunch. 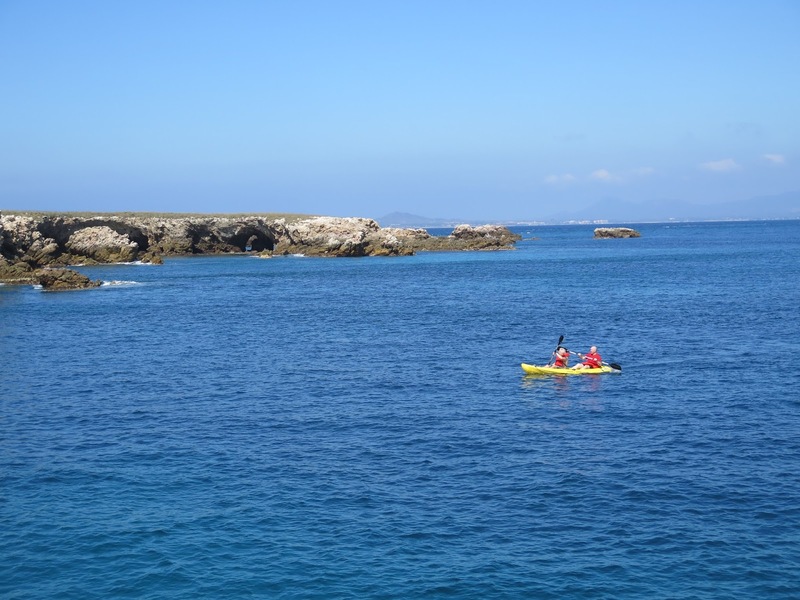 Then we were offered the opportunity to kayak or try their paddle boards. As I did not want my first time trying to get up on a board to be in front of 40 of my new friends, I took pictures instead. Kathy and Paul both tried it, and Jim and Paul took a kayak for a spin. As we headed back to the port, the crew of the boat put on quite a show for us. What a fun group of guys! 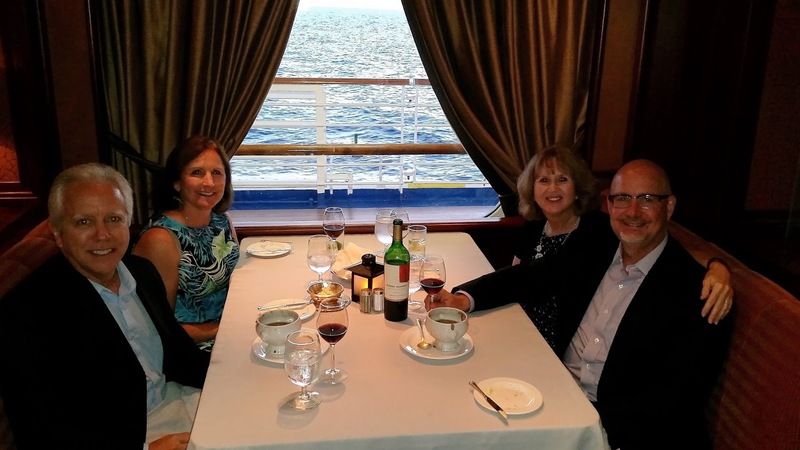 We have been on many excursions in the past, but overall I would have to say this five-hour cruise was the best in terms of friendliness of the employees, food, drink and boating activities. We all took a nap when we got back to the ship, and then showered before going to dinner. 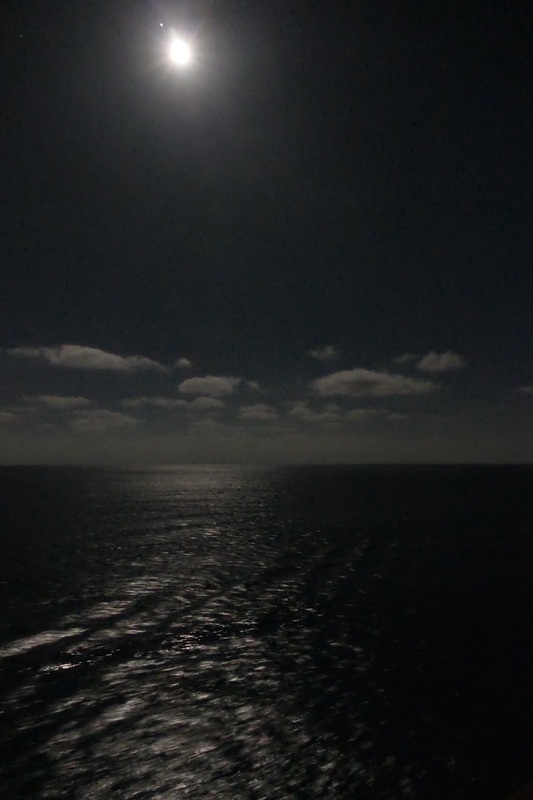 It was lovely to see the full moon as we cruised that night on our way to the second port of call in Mazatlan. As my husband's birthday loomed, I was trying to determine where to take him to celebrate this new milestone. He, too was turning 60. (Yes, I am a cougar. I married a younger man - younger by all of 5 months.) Originally we had planned to go to Australia/New Zealand in February, and that was going to be the trip. But due to an American Airlines new route issue, we decided we could not pull off a huge trip such as that one in the limited time we had. 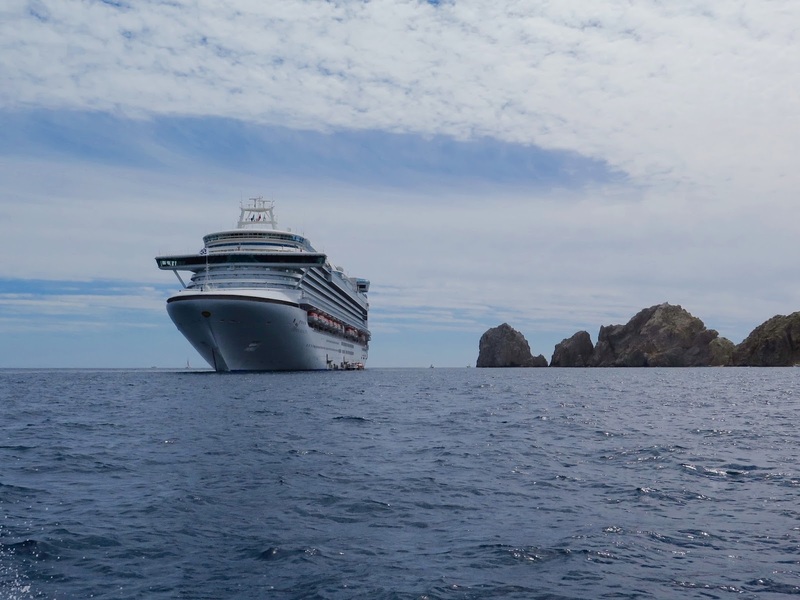 Our friends from Minneapolis (who were originally going to join us in New Zealand in February) suggested a cruise to the Mexican Riviera as an alternative. We have been to the Eastern Caribbean as well as the Western Caribbean with Kathy and Paul, so this would definitely be a new route for all of us. As the cruise originates and ends in Los Angeles, an added bonus is that we would be able to see our daughter as well. We booked the cruise back in January, planning the dates around another birthday surprise that my family had in store for Jim in early March. We flew to Los Angeles on Friday, February 19th, and the security line at Lambert Airport was unreal! In my 37 years of using this airport, I have never seen so many people. When the line finally advanced, I noticed a sign that read "American Priority Access", and there was no one in that line. Lo and behold, our boarding passes had those exact words on them. So we were able to hop over to the non-line. The TSA agent said that probably saved us 45 minutes in line. Yay us! The flight was on time, and the plane was a newer one with built-in entertainment units in each seat. That sure helps a four hour flight pass more quickly. 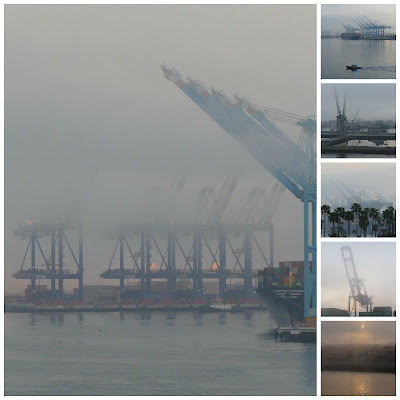 We arrived in LA in the early evening, and used Lyft (similar to Uber) for the first time to take us to the hotel, which was located by the Port of Los Angeles. That worked really well, and with the $10 new customer coupon they gave me, we only paid $17.33 for the ride. Our friends got in a couple of hours later than us, and we waited for them before walking to a nearby restaurant to grab dinner. They took Uber from the airport and paid $60! Our check-in time for the cruise was not until 1:30 on Saturday, so the hotel gave us a later check-out time. Following breakfast we walked to old town San Pedro. 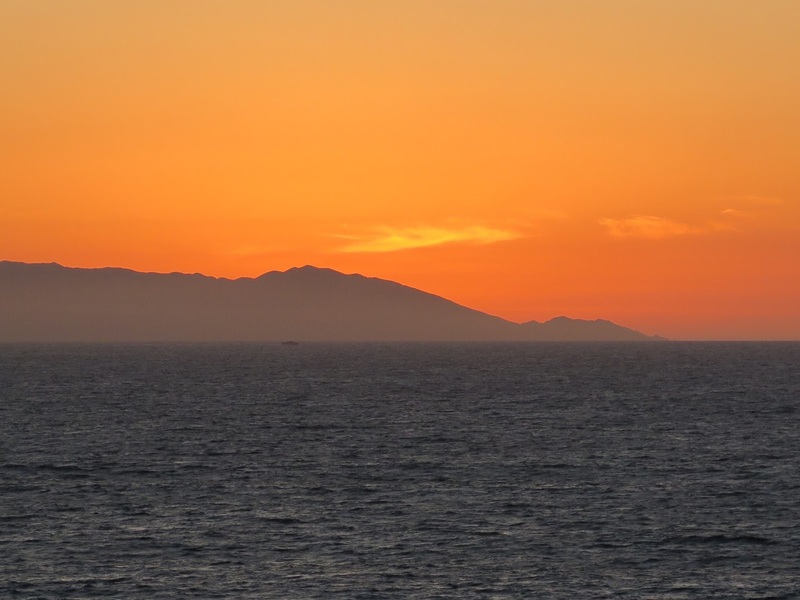 Located on the southern end of the Palos Verde Peninsula the area was first settled in 1769, though the Port of Los Angeles wasn't founded until 1907. We enjoyed walking through the old town area before heading down to see the USS Iowa. 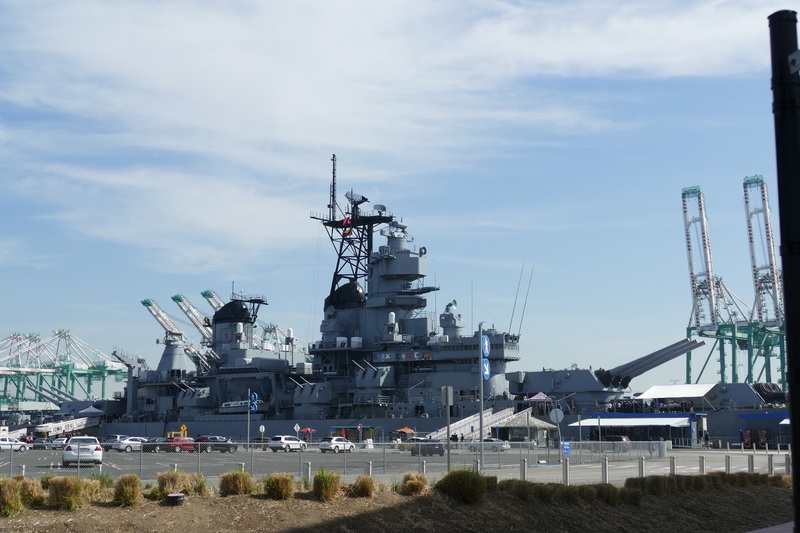 Now a maritime museum, the USS Iowa was originally commissioned in 1943 and served during WWII, the Korean War, and the Cold War. The ship was decommissioned in 1990 and moved to Los Angeles in 2012. Jim and Paul decided to do the ship tour, but Kathy and I thought the timing was a bit rushed, so we took a leisurely walk back to the hotel instead. 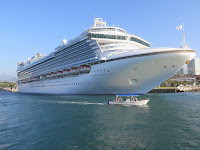 The hotel shuttled us over to the Princess cruise line port, and check-in was a breeze. We checked out our staterooms, which were located next door to each other, and then grabbed a late lunch before touring the ship. Finally we went to one of the top decks to watch the ship leave port, which was around 5:00 in the afternoon. 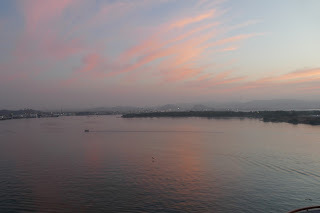 This was an unusual cruise in that we were on the ship for two full days before arriving at our first port of call. 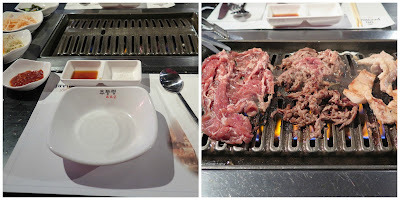 We filled the time with eating (surprise, surprise), visits to the fitness center (to combat the eating), sitting on the many decks, attending shows, and participating in lots of trivia contests. By the end of Monday we were eager to get off the ship the next day.